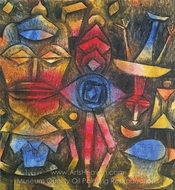 The enduring popularity of Paul Klee paintings has been attributed to his incorporation of several art movements into his body of work, such as Surrealism, Expressionism, Futurism and Cubism. 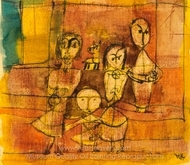 However, Klee's versatility did not end with his abstract, often ambiguous style of painting. He also used a variety of mediums with which to present his provocative images -- oil paint, pastel, watercolors, etchings, wallpapers, metallic foils and oils with tempera. Deftly integrating boldly outlined geometric shapes, numbers and letters with startling combinations of animals and human anatomy, Klee infused a dry sense of humor as well as political convictions into art pieces that frequently alluded to dreams, poems and musical themes symbolized by quasi-hieroglyphics. Born in Munchenbuchsee, Switzerland in 1879, Klee is technically considered a Swiss and German painter. With a Swiss mother who sang professionally and a father who taught German music, Klee received encouragement to develop his musical talents and eventually mastered the violin when he was 11 years old. As an adolescent attracted to the radical freedom represented by the career of a nonconforming artist, Klee eventually rebelled against the restrictions involved in playing 18 th and 19 th century violin music and enrolled at the Academy of Fine Arts in Munich, Germany in 1898. The impact of this early exposure to music is reflected in the musical symbols and abstract imagery seen in many Paul Klee paintings. Upon earning a Fine Arts degree, Klee moved to Italy with a friend and began studying classic Italian painters. Unsatisfied and discontented with Italian art, Klee returned to Bern where he lived with his parents and experimented with using a needle to draw on a blackened piece of glass. 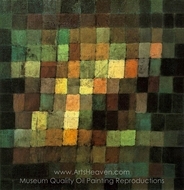 This technique inspired him to create 57 art works that were eventually included in a series called Portrait of My Father (1906). Between 1903 and 1905, Klee also completed several zinc-plate etchings that were part of his first exhibition, Inventions. After marrying a Bavarian woman named Lily Stumpf in 1906 who gave birth to a son, Felix Paul, Klee progressed from magazine illustrator to painting a series of characteristically absurdist images that led to a solo exhibition and an inevitable affiliation with Der Blaue Reiter group. Led by Franz Marc and Wassily Kandinsky, the "blue rider" group shared a fascination with abstract arrangements, florid colors and dimensionless perspectives intended to counteract what the group felt was the crass materialism andd corruption of early 20 th century Europe. Der Blaue Reite r title came from a symbolic image found in many of Kandinsky's paintings -- a horse and rider that signified Kandinsky's rejection of pragmatically conventional representations. 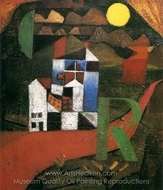 In 1914, Klee painted what is thought to be his first real abstract titled In the Style of Kairouan. Composed of circles and his trademark colorful rectangles that literally demanded attention and symbolized musical composition, this painting set the tone for future Paul Klee paintings that emphasized complementary colors, abstract surrealism and an odd sense of disjointed harmony. 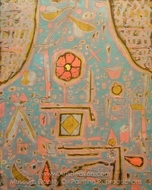 Klee exhibited what his considered his masterpiece, Ad Parnassum, in 1932. His technical ability as an artist along with his exceptional talent for integrating pointillism into this classic work of art earned him an established position in the art world as one of the most influential artists in regards to color theory, color mixing and use of geometric forms to elicit an emotional response. 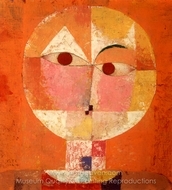 Additionally, Klee's treatise called Writings on Forms and Design Theory is a brilliant collection of lectures on the condition of modern art. Klee died in 1940 after suffering several years from scleroderma, a disabling, autoimmune disease that is treatable today. Remaining characteristic of previous Paul Klee paintings, his final painting called Death and Fire shows the German word "tod" (death) juxtaposed with an abstract drawing of a darkly-outlined skull against a deceptively mellow background of oranges, yellows and browns.